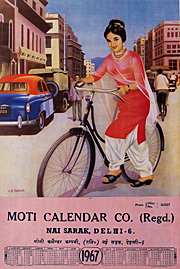 This exhibition presents a sociologist's-eye view of a rather neglected genre of Indian culture, ‘calendar art’, focusing in particular on the representation of women. By adopting popular characters in an ironic way, the artist addresses preoccupations and difficulties women encounter in India today. Moving Ideas is funded by Ville de Montreal; Conseil des arts et des lettres du Quebec; the Canada Council for the Arts and participating galleries. Other projects include additional exhibitions as part of Secular Practice: Recent Art from India at the Contemporary Art Gallery, the Charles H. Scott Gallery and the Vancouver Art Gallery; Dust on the Road: Canadian Artists in Dialogue with SAHMAT at the Roundhouse; a film program at Pacific Cinematheque, and a performance by Chapal Bhaduri at the Roundhouse, February 16. Saturday, February 16, at 6:30 pm | A community-wide opening reception at the Roundhouse Community Centre. 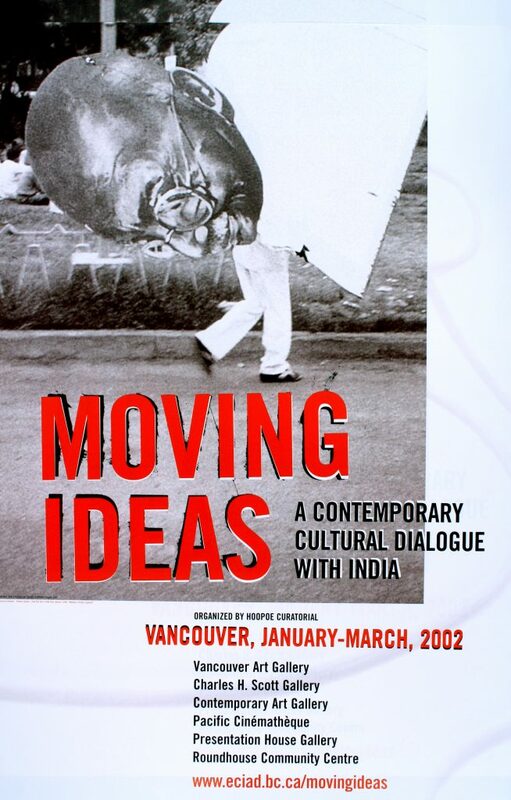 Poster for the exhibition "Moving Ideas – A Contemporary Cultural Dialogue With India"